Need a last-minute dessert for Easter Sunday? 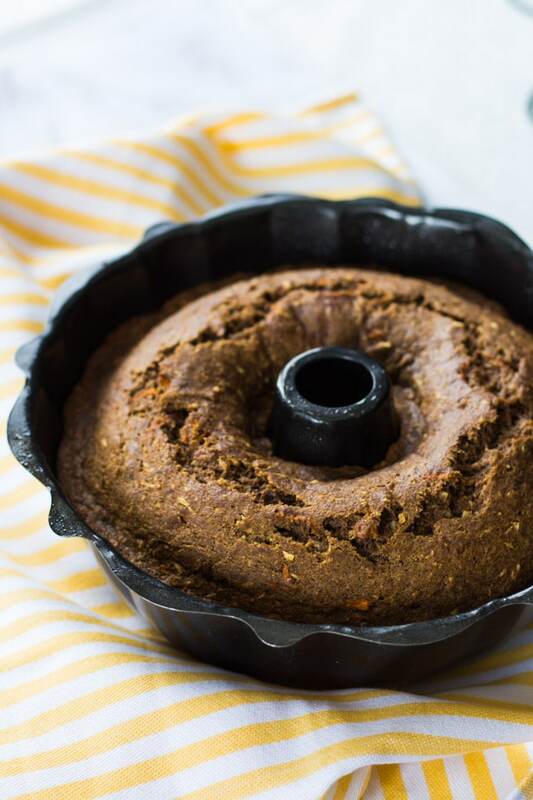 This quick and easy Coconut Carrot Bundt Cake is a healthier version of carrot cake, but it’s versatile, so it can be made as elaborate and decadent as you like! For some reason, carrot cake always reminds me of Easter. I’m not sure why. It’s not like this was a traditional Easter dessert when I was growing up. Who had time for dessert when there were so many crispy, nutty, chocolate bunnies to eat? In our house, carrot cake was probably more common around Christmastime, and now that I’m older, it is definitely more common around my birthday. Yup, I said it. I love carrot cake that much that it is usually my birthday cake 🙂 . Carrot cakes are moist and delicious and are covered with sweet, butter cream/cream cheese frosting. What’s not to love? Unfortunately, the buttery, sugary, creamy frosting now conflicts with my clean eating ambitions. So I decided to try to create a clean-ish carrot cake recipe that was still moist and delicious but had a few more wholesome ingredients baked into it. 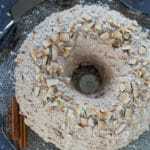 The result (after some trial and error), is this Coconut Carrot Bundt Cake. The great thing about carrot cake is that it already starts with a clean ingredient….carrots! I just made this version with whole wheat flour, cane sugar, unsweetened coconut, unsweetened almond milk, olive oil and a few other necessary ingredients. 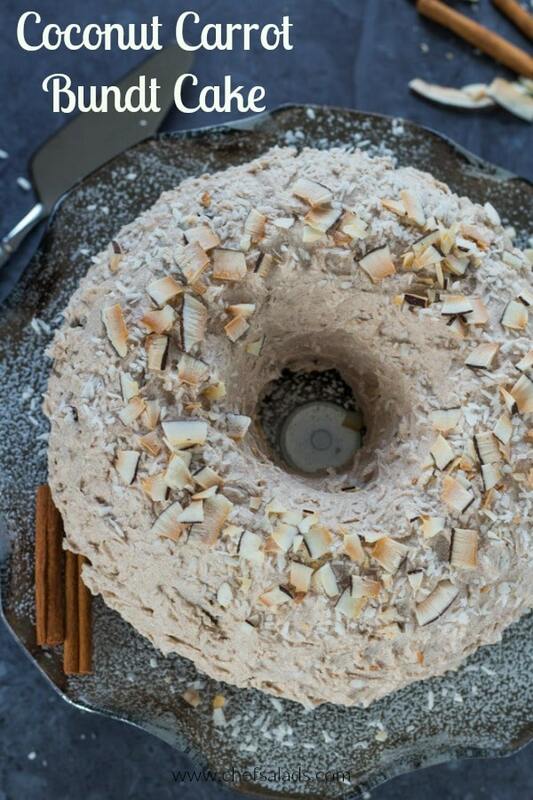 You can even eat this Coconut Carrot Bundt Cake on its own, without frosting. In fact, for the first few versions of this recipe, I actually made muffins. Plain muffins, no frosting. And they were delicious! But I couldn’t resist turning this into a cake and experimenting with some frostings. This cake is really easy to pull together. I didn’t use a mixer, just two separate bowls to combine the wet and dry ingredients. Then I just stirred the wet ingredients in with the dry ingredients. Once combined, I added the carrots, and then onto the greased bundt pan. And by greased, I mean I just sprayed the pan with cooking spray, no buttering or flouring the pan. After 50 minutes, this Coconut Carrot Bundt Cake baked up golden, staying perfectly moist on the inside. It didn’t burn or brown too much on the edges, which sometimes happens with a cake if you need to leave it in the oven long enough for the middle to bake. But this cake baked evenly and, once cooled, came clean right out the pan. Love it! For the frosting, I’m going to admit that it’s not entirely clean. 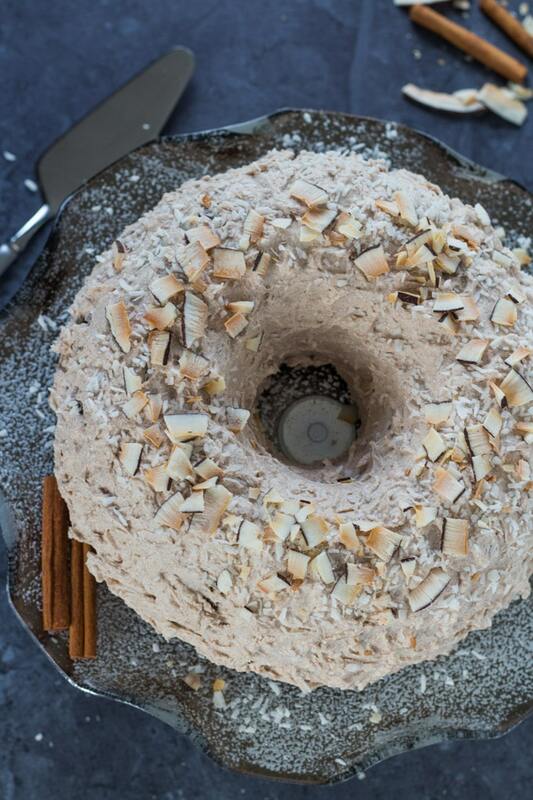 Hence, my suggestion for enjoying this Coconut Carrot Bundt Cake without frosting. But I also said it was a versatile recipe. So you can use whatever frosting you like. For the frosting in this recipe, I kept it half clean 🙂 . I used coconut milk and mascarpone cheese. (I am a bit obsessed with coconut milk as the basis of a frosting – remember these Flourless Ricotta Cupcakes with Chocolate Coconut Cream?). For this carrot cake recipe, I used one can of full fat coconut milk, refrigerated for 24 hours to solidify the coconut milk into cream, and half a 275 gram tub of mascarpone cheese. Mascarpone cheese isn’t really a clean eating ingredient. Sorry, clean eating friends, but I wanted to add a bit of cream cheese like texture to the coconut cream and I had a tub of mascarpone cheese in the fridge, so I thought I would give it a whirl. I think it turned out well! And this frosting is still a bit forgiving because I didn’t add a lot of sugar. I added just enough cinnamon, vanilla and maple syrup to sweeten it up a bit. (You can add a little bit more cinnamon or maple syrup to adjust the taste, but I wouldn’t go overboard). Overall, this cake is not as sweet as a traditional carrot cake, but it is still super tasty! I’ve already ate a piece and I’m probably going to eat another piece after I finish this post 🙂 . If you don’t have mascarpone cheese (because I realize this is not a staple food in most refrigerators! ), you can just use another can of coconut milk. If you don’t have coconut milk or don’t have time to refrigerate it for 24 hours, then go ahead and use Cool Whip or whipping cream. A little bit of decadence isn’t going to hurt anyone, right? 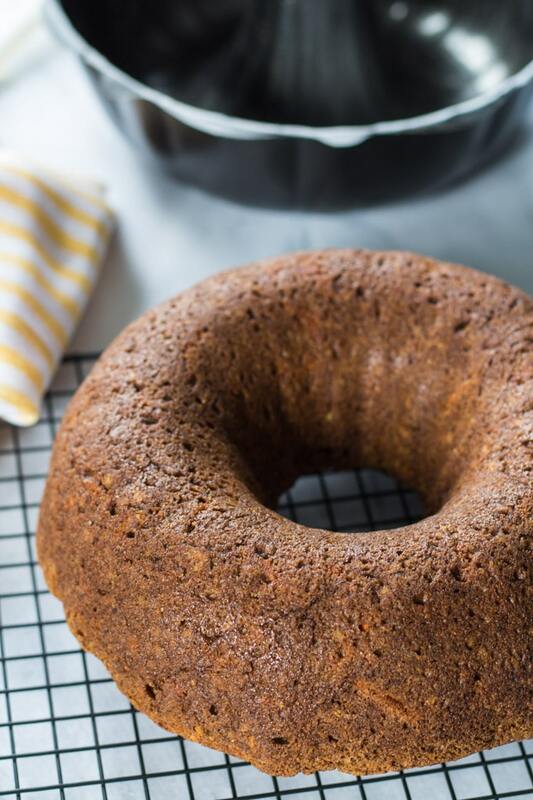 And if you don’t have time to frost this Coconut Carrot Bundt Cake (remember I did say this was a quick and easy recipe), then just serve up a slice with the cream of your choice on the side. 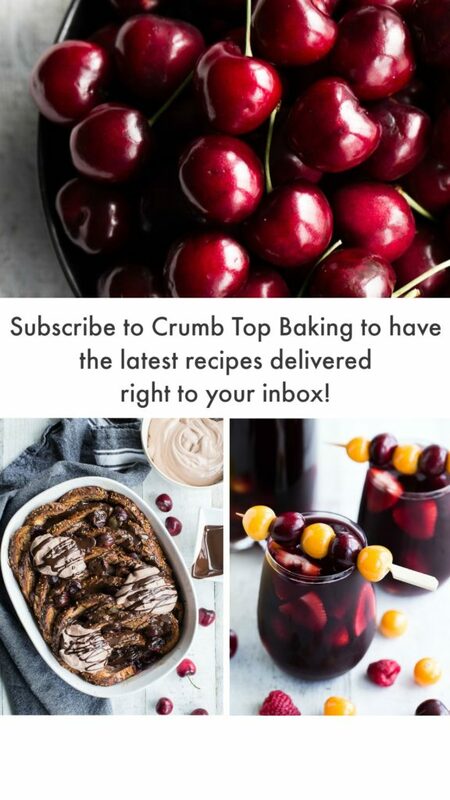 Dress it up with a cinnamon stick or a sprinkle of cinnamon sugar, and boom, you’re done! As always, if you make this, let me know your thoughts. And let me know what kind of frosting you decide to go with! 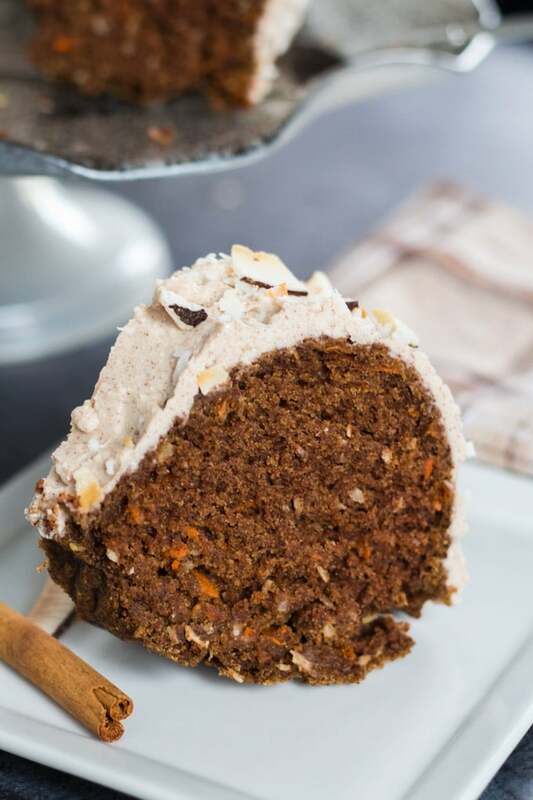 This Coconut Carrot Bundt Cake is a perfect spring dessert. 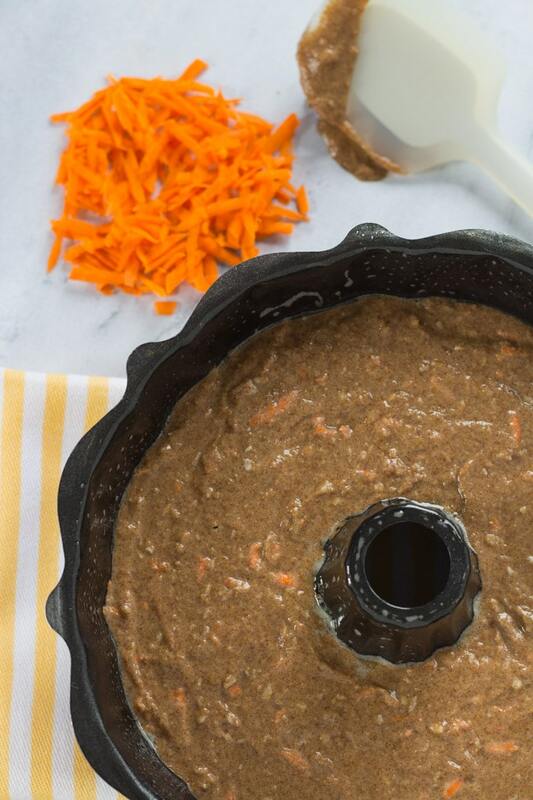 It is easy and versatile, and with ingredients like whole wheat flour, cane sugar, olive oil, and unsweetened coconut, it’s cleaner than a traditional carrot cake. Preheat the oven to 350 degrees and grease a 10″ bundt pan. In a large bowl, combine the flour, sugar, baking soda, salt, cinnamon and coconut. In a separate large bowl, mix together the oil, almond milk, vanilla and almond extracts. Gradually stir the wet mixture into the dry mixture. Once combined, stir in the grated carrot. Pour the batter into the bundt pan and bake in the oven for 45-50 minutes, or until a tooth pick inserted in the middle comes out clean. Open the can of full fat coconut milk that has been refrigerated for 24 hours. Scoop the solidified coconut cream from the top of the can (leaving the coconut water in the bottom of the can) and add to a deep mixing bowl. Using an electric mixer, beat the coconut cream on high for one minute. Scrape down the sides and add the mascarpone cheese, cinnamon, vanilla and maple syrup. Continue beating the coconut cream/mascarpone cheese mixture on high until all ingredients are well combined. This could take a few minutes. Once whipped together, begin frosting the cake. (If pressed for time, just serve the frosting on the side with each slice of cake). Decorate with unsweetened flaked or shredded coconut and/or toasted coconut chips. You can definitely get 10-12 servings from this cake. If the cake is frosted, leftovers should be stored in the fridge and consumed within 2-3 days. If the cake is unfrosted, store on the counter in a covered container for up to 5 days. This looks amazing and your photos are incredible! This looks divine! 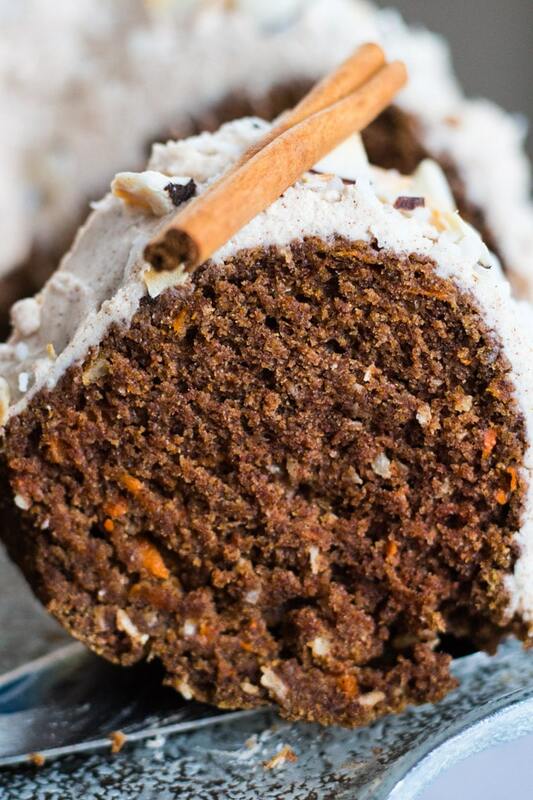 I love, love, love carrot cake and you’ve taken it to a whole new level with the coconut icing! Can’t wait to try it out! Thanks Jessica! I add whipped coconut milk as a topping to most of my desserts, but it really goes well with this coconut carrot cake. I would love to know what you think if you make this cake. Hope you’re having a great weekend! Thanks Lisa! I make this recipe year round, but it’s usually on repeat during the spring season. It’s a great dessert for Easter and spring brunches! I laughed when I read your post because I too feel like much of what I do for my blog conflicts with my attempts to eat clean. Not only that but then I have all the leftovers to deal with, which means, I’m constantly munching on sweet buttery treats much more than I should. The struggle is real for all of us! I appreciate your efforts to make carrot cake a little less “naughty”! Haha! The struggle is definitely real! Thanks Janice. I usually give a lot of my baked goods away. I’m lucky to have family living close by and hungry co-workers! ;) But I usually keep most of my savoury dishes as they make for quick meals during the work week. Thanks for stopping by! OH! Could you please pass me a slice through the screen! Seriously though, I am a sucker for any kind of carrot cake. My husband’s birthday is coming up on Monday and I’m going to add this to the list of cake-y possibilities. Thanks Bernice! Carrot cake is usually my cake of choice for my birthday, so I hope you get a chance to make this one. If not for your hubby’s birthday, then sometime in the future! I’ll be making it next weekend for Easter!